Zack is a typical 15 year old teenager living in So. California. He enjoys hanging with his friends, playing on-line video games, dirt-biking in the desert, camping at the Colorado River, watching movies, texting his friends, and going to the beach. Zack has also taken boxing lessons and was on his high school wrestling team. 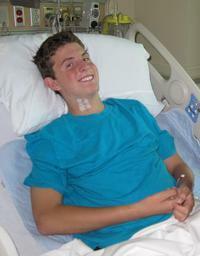 On May 31, 2010, Memorial Day, Zack Collie sustained a life-changing injury. While bodysurfing at Newport Beach, CA, he broke his neck at the 4th vertebrae and damaged his spinal cord. He was immediately paralyzed, fully conscious, and floating face down in the surf. Fortunately for Zack, Travis, his friend was close, turned him over and got him to the beach, saving his life. He was rushed to Hoag Hospital and then transferred to CHOC in Orange, CA. After a six hour operation he remained at CHOC for two weeks. From there he was transported to Casa Colina Inpatient Rehab in Pomona, CA. He will be in Casa Colina Rehab for about six weeks where he is being taught life-skills to learn how to function with his disability. Presently he has some movement in his forearms and is paralyzed from the chest down. When he is released from Casa Colina he will return home and enter an out-patient physical therapy program at Project Walk in Carlsbad, CA. (www.projectwalk.org). Project Walk developed and practices The Five Phases of Recovery: (The Dardzinski Method™), an intensive exercise-based recovery program designed to stimulate the nervous system. The method was created and continues to grow and adapt from years of experience working solely with spinal cord injuries. This is not a six month, one or two year program. It is a program dedicated to pushing you as hard as possible to recover as much as possible, however long it takes. This is the program that their clients have chosen who have made the most recovery. Unfortunately, Project Walk is not covered by insurance. Because of this and other uninsured costs Zack’s family and friends have started a fundraising campaign through Help Hope Live. This nonprofit organization has worked for nearly 30 years with the organ/tissue community and in 2000, they expanded their mission to assist those who have sustained a catastrophic injury such as Zack’s. All donations made to Help Hope Live in Zack’s honor go directly to his injury-related expenses and are tax-deductible to the full extent of the law. If the donation is made by check, 96 cents of every dollar goes to Zack’s uninsured expenses. If the donation is made by credit card, 93 cents of every dollar goes to his uninsured expenses. Any contributions will be greatly appreciated and will help Zack on his way to recovery. $50 will give him a half hour of therapy. $100 will give him an hour of therapy. $300 will give him a day of therapy. $900 will give him a week of therapy. $3600 will give him a month of therapy. Please call 800-642-8399 or click on the “Donate Now” box at the top of this page. Be sure to also click on the “My Webpage” under “My Links” box in the upper left corner to follow Zack’s recovery progress and see his latest photos. Thank you for your generous support and prayers for Zack. They are greatly appreciated.